Let’s take a look at Earth Main / Crimson Fist. What you need to know about Earth Main @ Crimson Fist? You can choose Crimson Fist at the starting of the game as your starter character when you play Naruto Online. Earth main is extremely powerful in tanking taijutsu and ninjutsu damage. Although he is not a great damage dealer, he is able to provide great support for your lineup. I often suggest people to use Earth main to support other ninjas in their team to inflict great amount of damage. However, you can use Earth Main as a damage dealer for early games when you’re starting off. Like all the other main characters, Earth main have five talents in Naruto Online game. 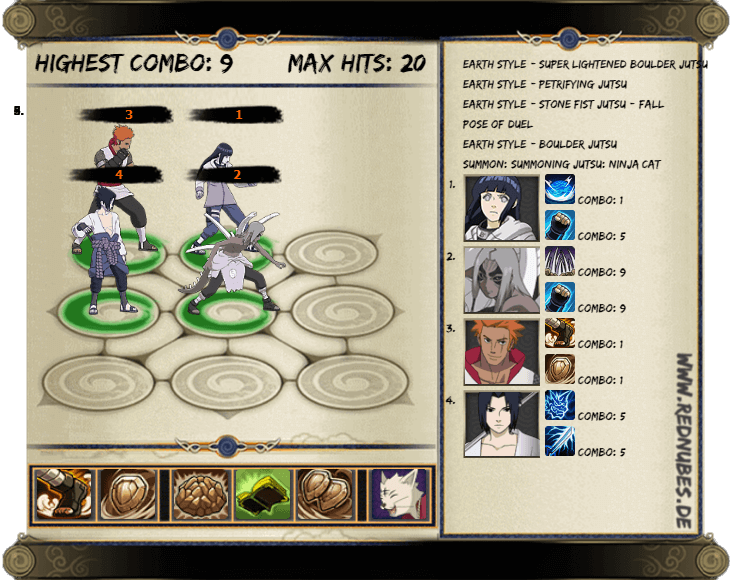 At the beginning of the game, the offensive mystery of Earth Main like Earth Style – Stone Fist Jutsu helps the team to easily Interrupt opponent’s unit and inflict damages. Moving forward to middle and late game, it is well suited for Crimson First to play defensive support role for the lineup. This is because the 2nd and 3rd mystery provides great boost for the team. The 2nd skill produces AOE damage up to four units while creating shield for the entire team. This skill will increase your team’s survivability in mid-game. The 3rd skill will remove 1 layer of Debuffs and gets your entire lineup 1 extra standard attack. When you have strong damaging ninjas, this skill will allow your team to easily overpower you opponent team. Although the last mystery skill provides shield and chakra recovery, I will not suggest you to use this skill for your lineups. Three of the standard attacks focuses on damage while only one standard attack focuses on producing shield for 2 units of your lineup with the least Life points. This standard attack will be unlocked only at level 50. Till you reach level 50 you need to use the damage based standard attacks which is important at early game as other ninja characters in your lineup would not be able to make massive damages. You need to make sure your main character makes damages to ensure higher damage output to sustain fight against your opponent lineups. Just make sure the standard attack of your choice works well with your lineup and your chase skill. Let’s take an example on how you can make your chase skill work. You will have Sasuke who gets his chase skill triggered when any of the unit’s in your lineup cause Low Float. As you can see Earth Main has a chase skill that causes Low Float, so once you use that chase skill, Sasuke will use his chase skill. However, you need another chase skill to trigger Crimson Fist’s chase skill because the chase skill only works when an unit gets Knocked Down. Ninja characters like Hinata can cause Knockdown. With the right ninjas, you can have successful chase combos. As for the first set of passive skills, I will suggest Crimson Earth players to use the first passive skill: Bottom Force only when you don’t have Tank ninja characters like Kimimaro or Hinata. I would agree that Earth main will be a great Tank but he is more suited for support role. The best passive skill to use for your lineup will be 2nd and 3rd skill as it will buff your team lineup. I never used the 4th passive skill in any of my lineups because I never use Earth Main for damaging purposes. If you think you’ll be successful at using the 4th passive skill, I won’t stop you. Pose of Duel is my favorite passive skills of Crimson Earth. It will increase the Ninjutsu and Attack of Ninjas who already have shields. For example, when you use Gaara or Iruka (only shields Konoha ninjas) they will create shield for your team. When your lineup have shields, it will automatically increase the Attack and Ninjutsu of the ninjas with your 2nd passive skill. The second row of passive skills provides some of the powerful passive skills which mainly increases the Defense and Resistance attributes. Although the Guidance passive skill helps to boost the Attack and Ninjutsu of Male ninjas in your lineup, I’ve never seen any players using it. I feel the other passive skills are much more beneficial for the entire team than Guidance. The first passive skill in this second row will provide shield only at the beginning of the round. It allows your team and also other teams (during Team Instance and GNW) absorb damages in the first round of the battle. For me, the third passive skill: Defense Knowledge is the best among others. Let me explain to you why. When you choose this passive skill make sure not to have your Earth Main on the front line because if your main character dies, this passive skill won’t have any effect for your lineup. The increase in Resistance and Defense will make your whole lineup tanky with the right ninja characters. Like the earlier guides for main characters, I will provide the basic lineup for Crimson Fist. I will be writing more team builds for Earth main in the Team build section. This lineup will be good until you reach level 60. If you manage to get any rare or super rare ninjas, make sure to add them to your lineup and get the main character skills right. For this lineup we will be using the 3rd Mystery skill which allows everyone to have 1 additional Standard Attack. The damage output for this team will greatly increase with the ability of Kimimaro to make 9 combos with his standard attack and mystery. I chose Earth Style Boulder Jutsu passive skill to shield all the ninjas in this lineup. Without the shield, the other passive skill Pose of Duel will be useless. By providing shield to all the ninjas in the lineup it will also increase all the ninjas attack and ninjutsu with Pose of Duel. As for the chase skill, Earth Style – Stone Fist Jutsu is perfect for this lineup as it will lead to successful combos with other ninjas in the lineup. I did not add any rare summons for this lineup as around level 50 to level 60 it’s pretty hard to get any rare summon as you need to draw 60 summon scrolls. But it will be relatively easier to capture Ninja Cat who will help you create successful combos with your team. I will definitely write more team builds for Earth Main soon. What do you think about this Earth Main / Crimson Fist guide? If I missed out any important information, please do share with us by commenting below.